Most little boys dream of the Old West and riding horses on an open plain. 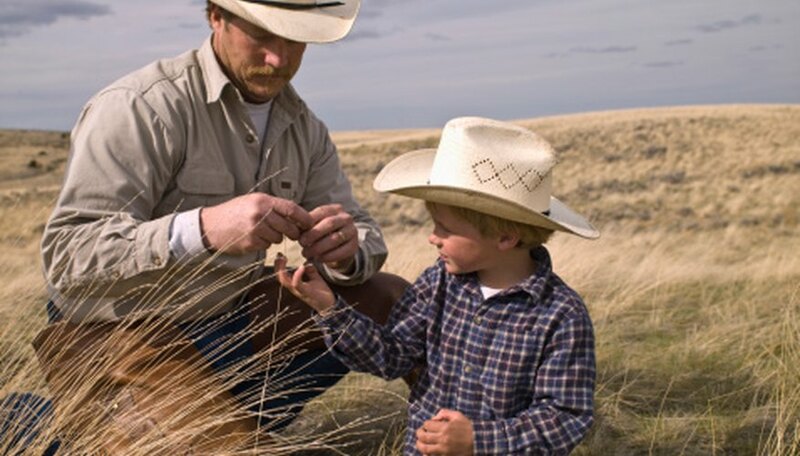 Cowboy hats, roping and riding are all appealing to little ones. While most of kids will not grow up to be a real, working cowboy someday, there is much enjoyment to be had with imaginative play. Easy Western crafts can help your little cowboys and cowgirls enjoy a piece of the Old West right in their own home. Trace and cut a tennis shoe onto brown construction paper to create the shape for the horse's head. Cut a long triangle (about the same length as the head) with the tip cut off to serve a the horse's neck. Cut two smaller triangle ears. Glue your horses neck, head and ears together and draw eyes with a marker. Cut 1-inch pieces of yarn to make his mane. Tape the horses head and neck to a wrapping paper roll and let your cowboy ride around the house. Use a paper lunch bag to create a cowboy puppet. The side of the bag that has the flap will be the front of the puppet. Flap will be the mouth. Have kids draw a face and clothes onto the bag. A mustache and plaid shirt and vest will give the puppet a distinctly Western feel. Cut a cowboy hat shape from brown construction paper and attach to the top of the puppet's head. Cut a sponge into a "U" shape to represent a horseshoe. Pour eight parts brown paint to one part glue into a shallow dish. You will only need a small amount. Dip the sponge into the paint and press onto a sheet of paper. Sprinkle some sand over the top and shake off the excess to give the horseshoe prints an interesting texture. Cover a shoebox with brown construction paper. Use white construction paper to make an arched covering for the top of the box (wagon). Glue the two sides of the paper to the outside of the box and leave the two arched ends open. Cut four circles out of the cardboard, and glue to the side of the wagon for wheels. Draw spokes onto the wheels and wood grain to the side of the wagon.